Love & Promise Jewelers Blog - What is Moissanite Diamond? Diamonds remain one of the most precious and sought-after gems in jewelry, but there are a few cost-effective alternatives used to make equally luxurious jewelry. Moissanite is a popular example. Moissanite was originally discovered by French Scientist, Henri Moissan, in 1893. Moissan found the gemstone in a meteorite crater in Arizona. At first, Moissan believed he had discovered diamonds- only to find out that the gemstone was composed of silicon carbide. Today, moissanite is developed in laboratories by synthesizing the same elements found in Moissan’s discovery. While moissanite looks similar to a real diamond, there are a few differences to note. One of the biggest differences between moissanite and diamond is the toughness of the gemstone. On the Mohs Scale of Hardness, a rating system for a gem’s resistance, moissanite scores a 9.25 out of 10, which still means it’s tough to cut and perfect for jewelry. Diamond, however, is still one of the hardest minerals in existence, scoring a perfect ten on the Mohs scale. Both should be able to withstand the daily wear and tear that jewelry goes through. Moissanite is also more heat resistant- up to 2000 degrees Fahrenheit, which means it won’t break or burn when being repaired. No matter where they’re from, real diamonds are colorless, resulting in a bright white shine. However, you can still find diamonds in some jewels with certain hues. This is due to imperfections in the composition or cut. Blue and pink hues can drive up the value of a diamond, while yellow hues can lower a diamond’s value. Moissanite is not colorless, usually having a yellow or green hue. However, depending on the size of the gemstone, moissanite can still be made to look near colorless. Light affects diamonds in three ways: brilliance refers to the light reflected by diamonds, dispersion refers to the light refracted, and scintillation is the surface light of the diamond. Moissanite reacts to light differently but has the potential to be even more brilliant than the diamond, sometimes creating a rainbow flash. In addition, moissanite is less likely to attract dirt or grease and should hold its shine for longer. Of all the differences between moissanite gems and diamonds, the most noticeable one might be the price you end up paying for each. Moissanite is significantly more affordable than the diamond, although there are a few factors that affect value. For diamonds, the 4 C’s typically determine a diamond’s worth. For moissanite, the value remains constant, with size and color as the main factors. 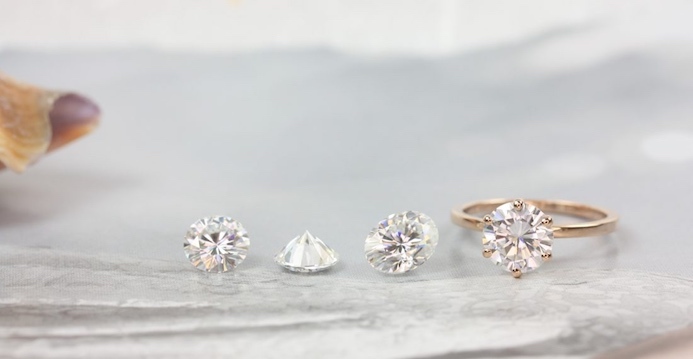 Despite the differences between moissanite and diamond, the best thing about moissanite is how similar it is to diamond at the fraction of the cost. Jewelry can be a significant financial investment, and moissanite offers an effective and affordable means of giving something special to someone special. Moissanite has proven that not only does it look like diamond, but it behaves similarly as well, maintaining its shine and withstanding daily wear and extreme temperatures. Because of this, moissanite can retain, even grow its value over time. Love & Promise Jewelers only sells the best brands in moissanite, one of which is by Charles & Colvard, the original creators of moissanite. Charles & Colvard are the purveyors of moissanite cultivation technology. Some of our most popular engagement rings are made of moissanite, such as the Rosados Box Federella 9x7mm Platinum Oval, or the Rosados Box Gwen 8x6mm & Gabriella 14kt Rose Gold Oval F1. Finally, a way to show your loved one how you feel without breaking the bank. Follow the Love & Promise Jewelry blog for more guides and resources on gemstones and jewelry.